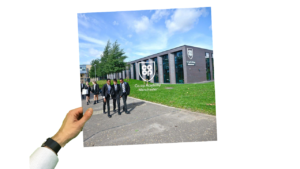 Welcome to Co-op Academy Manchester’s website. As Principal of the academy, I hope it will give you a flavour of what makes life at the academy so special. We have high expectations of our students. They all have a talent and can excel at something. Our lessons are engaging and use the best resources. Our curriculum prepares students to achieve their aspirations, whether that means going on to college and university, or taking an apprenticeship. All students and staff are members of one of our academy Families. We have six Families named after co-operative pioneers. These men and women (from all over the globe) embody our academy spirit. Some are historical figures from the founding of the co-operative movement, whilst others have made a difference in the world more recently. In Year 11, students move into our seventh Family called ‘Tenacity’ as they focus on their exams. We care about our students. Their tutor sees them every day and each year group has a Learning and Pastoral Support Officer (LPSO) who acts as a Head of Year. They ensure students have the support they need. We have a wide range of specialist staff who ensure all students are supported to succeed, including our Special Educational Needs and Disabilities team and those who lead our Gifted, Able and Talented programme. Our academy is not an exams factory. Whilst we push students to achieve the best results they can, their time here also includes many opportunities to flourish in extra-curricular activities. Our annual academy production gives students a chance to shine as actors, singers and behind the scenes. We have a wide range of sports clubs and other after-school activities. Throughout the year our students experience a wide range of enrichment activities. The academy is one of a number of schools sponsored by the Co-op – one of the world’s largest consumer co-operatives, owned by millions of members. Co-op is a different kind of business, which puts social goals and community-led programmes at the forefront of what it does. We are proud to benefit from the expertise of Co-op colleagues on our governing body, and they also offer unrivalled opportunities to our students to learn about business and ethical issues. We collaborate closely with our sister academies in the Co-op Academies Trust; through co-operation, we raise standards and offer our students the very best. I am proud to work alongside such talented staff and students every day, and look forward to welcoming you to the academy to share in our success.